This surgery, known as a FHO, is considered when the head of the femur bone is fractured or in cases of severe hip dysplasia: when the operation is successful, the leg regains function and it stops the severe pain of the femur bone rubbing against the damaged hip socket. This surgery might sound sophisticated, but basically we're simply removing the head and sometimes a little of the shaft of the femur bone so that it doesn't rub and grate on the hip bone. Possible reasons for needing to do this are severe damage to the pelvis or femoral head, dislocation of the hip joint... common in "hit by car" accidents... or for advanced cases of arthritis of the hip. Unfortunately, this surgery is often chosen instead of the much superior option of fixing a fracture or dislocation because the owner doesn't want (or can't afford) to pay for fixing the fracture. Doing a femoral head removal costs a few hundred dollars. Having a orthopedic specialist fix a shattered leg with surgical plates can cost several thousand dollars. (A major reason to consider getting pet insurance) On the other hand, it's a better option than leg amputation or euthanasia. The surgery is usually successful, especially well in mid size and smaller dogs. It often works well for large breed dogs too, but large breed dogs are more likely to have problems supporting their weight without an intact femur. 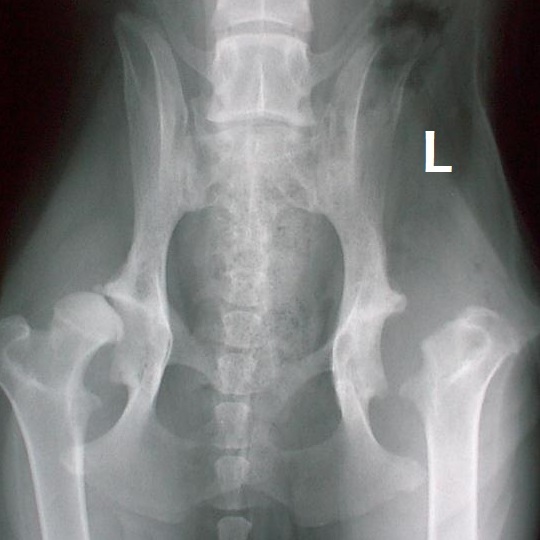 The surgery certainly relieves pets of the agony of having their leg bone grind into a damaged or chronically inflamed hip socket with every step. I do this surgery at our hospital, other vets like to refer to specialists for femoral head removals. Speaking of specialists...there are now physical therapists for pets in most states just like there are for human orthopedic patients. The goal of the surgery is to form a "false joint", which leads to the formation of fibrous scar tissue around the rounded off bone end. The hardened muscle or scar tissue then acts like a pivot and support point for the bone. Once the surgery site has had time to heal (3-8 weeks) there is usually very little pain and enough support to bear weight, which is our goal. Some dogs will have an obvious limp for the rest of their lives and other times there is no evident limp at all. Some injuries are so bad that a femoral head removal is the only reasonable choice even if you are willing to pay several thousand dollars for a specialist. There are techniques where the joint is "fused" or "stabilized". There are several possible stabilization procedures, including pinning the femoral head to the hip socket, changing where the muscle attachment occurs to a different site on the femur, toggle pinning the femoral head and several other techniques that are above my pay grade. Total hip replacement is another option. Just an introduction to this common surgery. In the radiograph above, you can see where the left femur head and neck have been removed and that there is a muscle between the pelvis and the remaining femur so that the two bones don't rub and grind against each other.